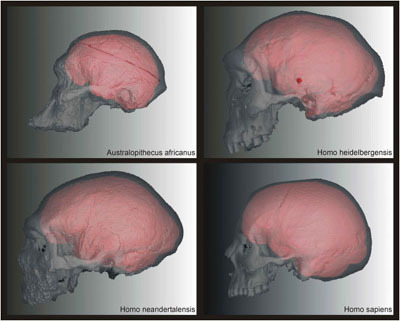 Virtual endocasts (red) and crania (transparent) of four hominid taxa in comparison to visualize the differences in shape and relative position. Internal or hidden features often bear key information. Virtual Anthropology permits a look inside. The virtual representations of real objects, be they patients or fossils, can reveal morphological features not accessible in real space. The prerequisite is a volume data set such as a CT- or MR-scan. The internal morphology is accessible throughout the whole volume, which means that structures can be dissected non-destructively within the computer environment. Features of soft tissues such as the brain or blood vessels, and features of skeletal elements such as the endocranial cavity, paranasal sinuses, inner ear, tooth roots and others can be investigated without endangering the patient or the original fossil. "Expose" was the driving force at the beginning of Virtual Anthropology, and still is its core. The exposed structures may be treated qualitatively or quantitatively or both. In any case, a sound knowledge of image processing is necessary to extract those structures from a 3D data set. "Segmentation" is the key and means that a certain structure is virtually separated from its neighbors, and subsequently treated as an independent unit. As early as 1902, only seven years after Roentgen's original discovery, Gorjanovic-Kramberger used radiographs to analyze internal features of fossil hominids.